Audio from the session: Transfemininities and transmisogyny. A facilitated discussion on the experiences of, and the unique ways sexism and transphobia affects those who express a feminine gender presentation. 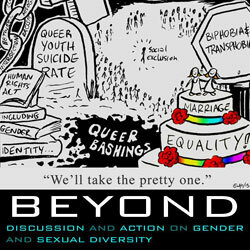 Topics include racial intersections with trans-feminine oppression, exclusion from "women's" spaces, the exaggerated hyper-sexualisation in the media coupled with desexualisation in queer spaces, what role "male socialisation" plays in AMAB (assigned male at birth) trans* people's experiences and more.